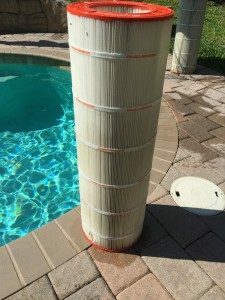 Pool Cleaning Fort Myers: FAQ How Often Should I Change My Pool Filter? I think I have had my pool filter for a while now, but I’m not sure how to tell when I should get a new one? What is a purpose of a filter? 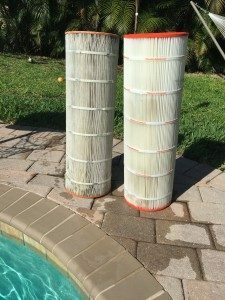 The primary purpose of a filter is to collect contaminants that try to make their way into your pool such as dust, leaves, pollen, algae, and bacteria. 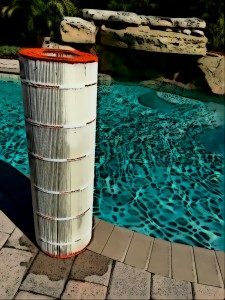 A filter plays a very vital role in keeping your pool clean, and your pool equipment functioning properly. My Filter Looks Fine, Do I Still Need to Change It? 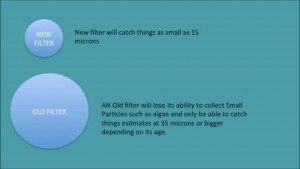 A FILTER SYSTEM’S EFFECTIVENESS IS MEASURED BY HOW SMALL THE PARTICLES IT CAN COLLECT ARE. THESE PARTICLES ARE KNOWN MICRONS. A HUMAN HAIR IS ABOUT 70 MICRONS. HUMANS CAN VISUALLY SEE THINGS AS SMALL AS 40 MICRONS. 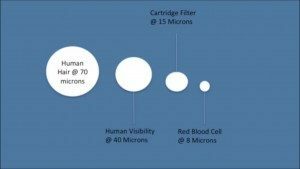 A NEW FILTER CARTRIDGE WILL CATCH PARTICLES AS SMALL AS 15 MICRONS. ABOUT TWICE THE SIZE OF A RED BLOOD CELL. HOWEVER, OVER TIME, A FILTER CARTRIDGE’S ABILITY TO CATCH PARTICLES THAT SMALL DRASTICALLY DECREASES. THIS IMAGE SHOWS AN EXAMPLE OF OLD FILTER THAT, DUE TO GENERAL USE AND WEAR & TEAR, IT CAN ONLY CATCH PARTICLES AS SMALL AS 35 MICRONS. SO YOU CAN’T ALWAYS JUDGE A BOOK BY ITS COVER: A FILTER MAY LOOK FINE TO THE EYE BUT REMEMBER IT’S ABILITY TO CATCH SMALLER ALGAE AND DEBRIS GOES DOWNHILL AFTER A YEAR. ALGAE RANGES FROM 1 MICRON AND UP SO RENEWING YOUR FILTER ANNUALLY WILL PREVENT A LOT OF ALGAE FROM MAKING ITS WAY INTO YOUR LOVELY POOL. IT ISHIGHLYY RECOMMENDED AS A RULE OF THUMB TO CHANGE OUT YOUR FILTER CARTRIDGE ANNUALLY. We are the pool cleaners to call in the Fort Myers, Cape Coral, Naples, and Lee County areas. Call us today to get on our pool cleaning schedule.